Mention Manhattan’s Tudor City complex to anyone and you might get a quizzical look. They may know it from the giant neon Tudor City sign, long dark yet still visible like a beacon from several blocks West on 42nd Street, but nothing about the Tudor Revival-style enclave that opened its doors in 1927 in its spot from East 40th to East 43rd Street from Second Avenue to the highway. According to Steve Corcoran, principal broker with Steven Corcoran Real Estate, “it’s as insular as it can be in a big city, very much unto itself like a small town.” The original tennis courts and miniature golf course may be gone, as is the tiny satellite of a U.S. post office, but the quiet convenience and beautiful brick buildings with their landmarked facades and casement windows remain intact. Some apartments are notoriously small and have woefully inadequate kitchens, but they are priced accordingly and attract first-time buyers eager to take advantage of what the surroundings have to offer. This Take Five installment deconstructs the appeal of the landmarked enclave. 1. It’s not about the views. There wasn’t much to see when developer Fred Fillmore French happened on the scene. When he began buying up rows of brownstones on Prospect Hill, an elevated dead zone between First and Second Aves., this now-pristine United Nations campus was the site of stinking slaughterhouses and meatpacking facilities, and a gas works. The area was easy pickings, made up as it was of tenements and rooming houses teeming with ethnically diverse immigrants. The surroundings were no garden spot: a glue factory stood nearby, and noisy elevated trains ran up and down Second and Third avenues. This low-hanging real estate fruit became what the Landmarks Preservation Commission called the largest parcel of developable land ever amassed in Manhattan at the time. To mitigate the lack of river views, French designed buildings that are virtually blind on the First Avenue side. The solid brick facades that sit several stories above street level and Ralph Bunche Park are punctuated only by windows in the stairwells. The fronts of the more majestic, taller buildings—5, 25 and 45 Tudor City Place—were designed with views of the Tudor Greens, Grand Central Station, and the rising New York skyline to the West, which by 1930 would include the iconic Chrysler Building and, soon after, the Empire State Building. French targeted a tasteful middle class public that worked in midtown, and spoiled them with service and white-gloved attendants. There were dining rooms, coffee shops, and newsstands in the buildings, while along the streets one could find dry cleaners, tailors, laundries, barbers, hair salons and a well-stocked grocery store. They were considered pied-á-terres, for those who lived in the city during the week but spent weekends in the new suburbs sprouting in the tri-state area. 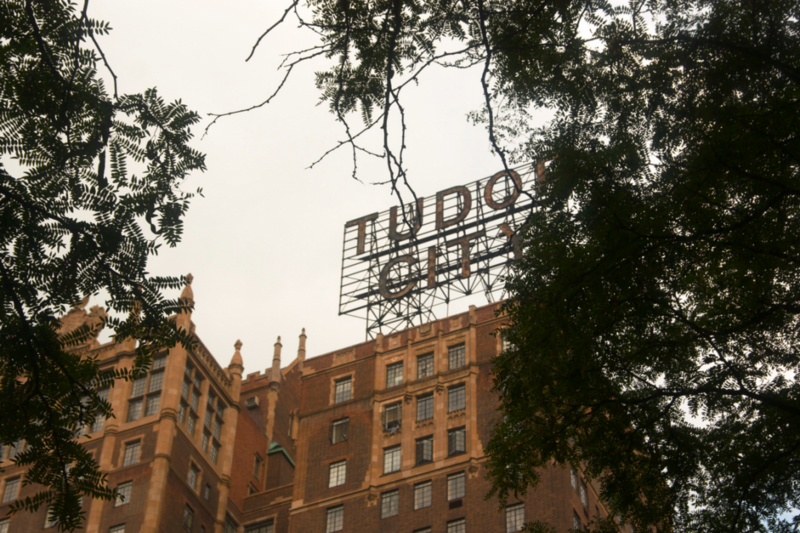 When construction was finished, Tudor City boasted 3,000 apartments and 600 hotel rooms, spread among nine buildings. There were three-story artists studios but many of the apartments were of modest size and meant for one occupant. They included a lot of “efficiency” studios, with Murphy beds, tiny refrigerators and no stoves (only hot plates), that were particularly popular for stowing the mistresses of midtown execs. 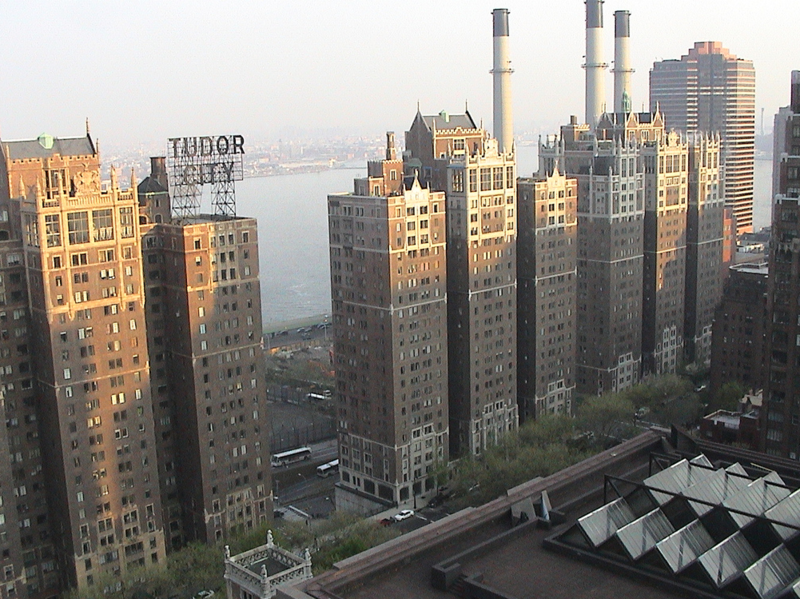 Commercially successful, Tudor City became a model for other large residential developments around Manhattan, including Knickerbocker Village, French’s 1,600-unit lower- to middle-income complex on the Lower East Side, and London Terrace on West 23rd Street. Much later, the concept of Tudor City informed the design of Battery Park City, according to Landmarks. But in the years following the war, the enclave became something of a red light district, well-known to cabbies and lonely males travelling through Grand Central. Rents subsequently fell; the jewel of midtown got shabby. 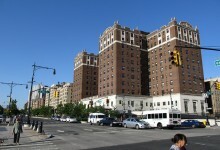 Developer Harry Helmsley bought up much of Tudor City in late 1970 with a plan to develop the two parks into skyscrapers. 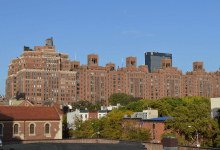 That plan was quashed by neighborhood resistance; Helmsley divested himself of the last of the properties in the mid-1980s and new owners Time Equities set about making the buildings into co-ops. 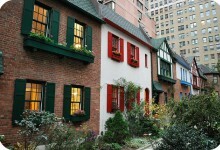 The enclave was declared a New York City Historic District in 1988. 2. The architecture is a marketing move of sorts. Decidedly un-hip and even hokey to some, Tudor City is named for the Tudor period in English history, from 1485 to 1603. The architecture is called Tudor Revival but in reality it is a mix of other styles used in England in the early part of the sixteenth century, mixed with Elizabethan details of the latter part of the 1500s. French chose it for Tudor City to appeal to prospective tenants eyeing the burgeoning suburbs where Tudor Revival was popular at the time. What he built were tall versions of those suburban manses in appealing red brick trimmed with grand buff terracotta, limestone, and sandstone decorative details. The exteriors of the buildings boast faux British coats of arms, copper lions bearing banners, elaborate turrets that house water towers, rooftop balustrades and friezes bearing Tudor roses, greyhound dogs, birds, stags, lions and other fauna. Street-level windows on common or commercial space feature elaborate stained glass windows that rival those of any church. Grand lanterns light the main entrance porticos of many of the buildings. Building lobbies vary greatly in size and décor. Many have the original faux half-timber theme, exposed brick, pointed Gothic entrances and window frames, slate floors and fake stucco walls. Some of the original furniture survives, its linen fold carving mimicked in the brass sconces on the walls. Grand carved fireplaces remain in many of the lobbies. 3. Its greenspace is divine. Come up the escarpment on the dramatic, curved Sharansky Staircase opposite the United Nations on First Avenue, or either of the staircases leading up from 42nd Street between First and Second avenues and you’ll find two lush, green rectangular parks that said “suburbia” and which French considered integral to the success of his development. Today they are a serene, beautifully manicured oasis defined by bench-lined gravel paths, a mature tree canopy complimented by new arrivals that replaced many lost in Superstorm Sandy, and a showy display of bulbs, perennials and flowering shrubs. In mild weather, the park is jammed with office workers eating al fresco lunches, families with young children, dog walkers (some call the nabe “Two-dog City”) or the neighborhood’s elderly enjoying some fresh air. There is a lively year-long schedule of events in the Greens that includes an Easter Egg Hunt, a Halloween parade, a pet costume parade, a menorah lighting at Hanukkah and a Christmas tree lighting. 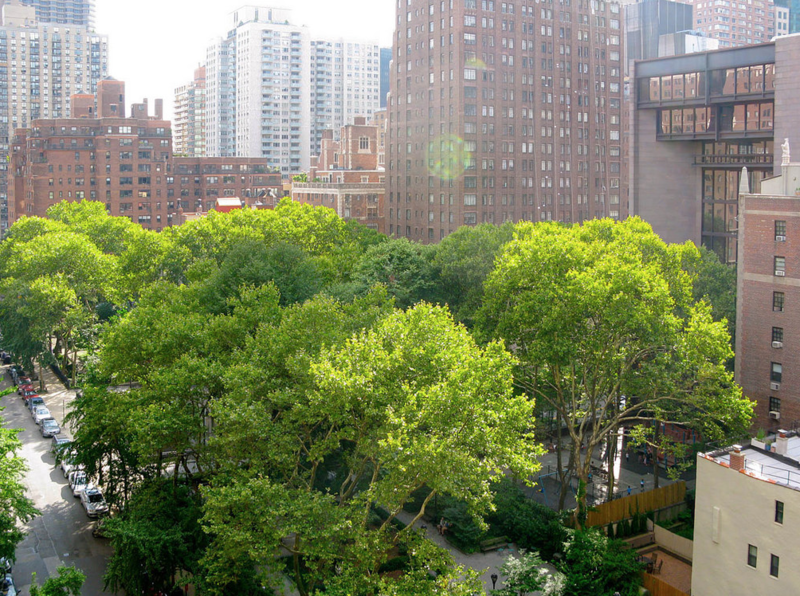 In summer, there is a concert series called Tudor City Concerts in the Parks, produced by Music and Art for City Greens. The brainchild of Katona Bennett, it is “a combination of the best live entertainment New York City has to offer: Broadway, jazz, classical and cabaret,” she says. And it is absolutely free. Park space in Tudor City. 4. It sits among some of the city’s architectural gems. 5. The real estate’s surprisingly affordable (for Manhattan). Sale prices on average range from $300,000 for a studio, $500,000 for a one bedroom and for a two-bedroom, “we’re not quite into the mid-$800,000s,” Corcoran says. Listings on Streeteasy include two 15th floor apartments at 25 Tudor City Place, a two-bedroom for $949,000 and what is called a 2-room studio for $320,000. 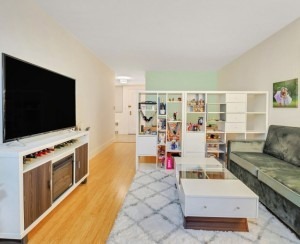 At 333 East 41st Street, a one-bedroom with 11 foot ceilings is priced at $719,000. She notes that Tudor City was once home to Charlton Heston and composer Billy Rose, adding that local characters also include a few eccentrics like the one who spent her days looking for Russian submarines plying the waters of the East River. “When you live in a 225-square-foot studio you are either crazy when you move in or become crazy pretty soon from bouncing off the walls,” she says.